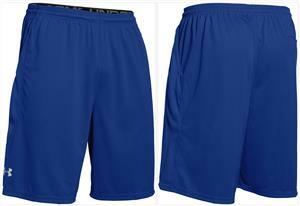 Under Armour Mens Team Coaches Shorts. Updated durable knit fabrication. Ventilated side panels allow for breathability and temperature regulation. Side and back button pockets. Top Selling Item. 10+ Why don't we show the price? 1 to 9 Why don't we show the price? To see our best price, add this item to your cart. Why don't we show the best price? Usually ships within 10 to 12 business days. - Updated durable knit fabrication. - Ventilated side panels allow for breathability and temperature regulation. - Side and back button pockets. Generous cut product, providing full range of motion, and a full, loose fit. WAIST 28-29" 30-32" 34-36" 38-40" 42-44" 44-46" 46-48"